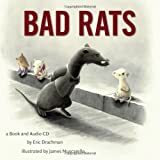 Written by the same team of Drachman and Muscarello, who have created A Frog Thing, Ellison the Elephant, It's Me!, and Leo the Lightning Bug, Bad Rats has the same format. It is a very nicely drawn story accompanied with an audio version. Here young Josiah and his other rat friends are scolded by Professor Perimeter for being bad. The older rat insists that the young rats conform to his standards, and stop doing anything that isn't properly rat-like. Josiah likes painting, and the Professor tells him to rip up his creations. The Professor tells Josiah's friend Priscilla to stop singing too. But their creativity cannot be smothered, and they eventually win over the Professor to the importance of self-expression. The story shows not just the importance of letting people express their authentic selves, but also the fallibility of authority figures. The illustrations are lovely, showing the downtrodden young rats being ordered around by the pompous and large older rat, and then managing to win him over and question his own moral code: these pictures convey just as much as the words. The CD has an introduction and an conclusion that include material not in the book, still done in character, but including the author. This is a charming book for young children.